"As Johnny Blaze hides out in Eastern Europe, he is called upon to stop the devil, who is trying to take human form." I'm not gonna lie to you all and say I know the source material comics of Ghost Rider all that well - yeah, I own one, but its not exactly a starter or anything like that. I have seen the first movie, which like most superhero flicks was an origin take and I thought was relatively decent (if not very goofy). I mean, for a guy that's power literally came from a pact with the devil that causes him to turn into a flaming leather-clad skeleton biker at night in the presence of evil and kill them with their own sins , it seemed maybe a little out of place (all that humor). I tell you what, the Rider at the start of this movie? Holy cow, that escalated quickly! Plot is semisimple, and anyone looking for massive depth of plot should probably just steer away from it. In easiest terms, the main story goes something along the lines of this: A woman named Nadya (Violante Placido) makes a deal with the Roarke the devil (Ciarán Hinds) to escape death that involves giving up her firstborn Danny (Fergus Riordan) who also happens to be the devil's kid. Years later down the road (when the kid is now 13 or so), Roarke sends in his minions led by Ray (Johnny Whitworth) to capture the kid so he can transfer his little demonic soul into the kids body (as human bodies just weren't made for demonic powers and have a tendency of getting used up). As all of this is taking place, good 'ole Johnny Blaze (Nicolas Cage) is hiding out in the middle east, as he finds his more flame-boyant side getting a little out of control when it comes to distinguishing how much evil is punishable. He is approached by Moreau (Idris Elba) after Moreau fails to talk Nadya into letting himself protect them, who promises to get rid of the curse of the Rider in return for him delivering Danny to his monk friends for protection until the prophesied day (in which Roarke shifts his soul to Danny's body) is past. That is the plot in a nutshell: protect Danny from becoming the new super-powered devil on Earth. We get a few additional. tidbits during the movie as well plot wise, such as a swift recap of how Blaze came to be the Rider, and who exactly the Rider is. The later is a very nice addition, as it adds depth of character to the spirit of vengeance and why he acts the way he does. We do have some humor involved, but its not nearly as much as the original movie. I'm perfectly okay with this because the rider comes off infinitely more frightening and nightmarish than he ever did in the first movie, and that laughter he adds in just makes it all the creepier. "...practical effects are the best effects..."
With the prospect of seeing a lot of the rider, however, comes the threat of every single thing being done as CG. I like to state that practical effects are the best effects, as they have a tendency to hold onto their charm or believability for longer than CG (especially bad CG), and there are moments during this movie where that really shines. The rider himself (what with all that fire) has some CG done to him pretty well as we could expect (although the bubbling leather on his coat is a nice touch that was never seen in the first movie, giving him a more dark feel about him), but later on in a scene where he crashes a car, the entire car is done in CG for the crash (when the 3 or 4 cars before it in the same scene are all practical crashes) and it fairs far worse than the rider does. Acting here is another hit or miss segment. Nicolas Cage is one of those actors who you know can do a decent job acting (because you've witnessed it in movies) but at the same time has just as probable a chance of doing a terrible job acting. In this case, for ninety percent of the movie he is being out-acted by nearly every other actor in the shot (including some of the background characters who only have one scene). His highlight of the film is actually a scene where he's trying to prevent the rider from coming out, and as such is getting real twitchy and crazy-like, at which he does an incredibly believable job. If I had to give an award to one of the actors for doing the best job in this movie, it would have to go to Idris Elba, as every time he's on screen his character is just bustling with intent and life. The characters themselves all come off pretty well, with the aforementioned Moreau being the most entertaining. Each has it's own little bits of backstory (surprisingly with the major exception of Moreau, who we get to see pretty solely as a protector / warrior monk-esque character), so there's just enough depth to them that we don't need to constantly ask why things are happening as the movie goes. The earlier segments where the rider are present changes the mood from a distinct action style movie to a more dark and scary feeling, brought in part by the rider's general lack of using words ("hungry") , whereas towards the end he returns to a more similar form and feel as the first film. Theres a nice bit of play off of each character, enough to make you feel that whoever is getting screen time has a reason to get said screen time. "...the horror movie sound it's superheated tires make..."
Audio is delivered well, from sounds to music to lines. Nothing particularly soundtrack wise jumps out and says remember me, but they all feel appropriate for the scenes they are in, with a few more modern songs (and by modern I mean one was the Beatles) that also fit in, but (in the case of the Beatles song) are relatively short in length. The sounds here are good, particularly the sound of the bike, and the horror movie sound it's superheated tires make as it's traveling. Heck, there's even a few one-liners in here that are delivered with varying levels of excitement (the rider saying "go home" when he sends someone to the pit sounds sort of deliberate and stale, for example). Although I can't speak from a huge knowledge-base of source material standpoint, I can say that compared to the first movie this one feels much more like it makes sense than the first movie. It's a mostly enjoyable watch, with very few moments that feel absolutely forced, and a twist or two that some people might not see coming (although the things is by no means something you would never expect). Most of the actors do a good job playing their roles, and the action pans out in a satisfying manner that can get over the top at times. 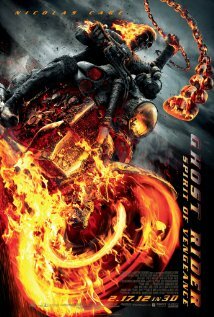 I certainly don't regret watching it, and if you are into Ghost Rider or superhero movies in general, it's something I think you won't regret watching.